Asymmetric or symmetric refers to the column configuration or the arm configuration of a car hoist. A two-post car hoist is designed to fit a range of car widths between them, but some with symmetrical arms (all four arms are of equal length) make it difficult to open a driver’s door to gain access to the vehicle, as the post obstructs it from opening wide when the vehicle is raised, therefore the width between the posts need to be made wider. 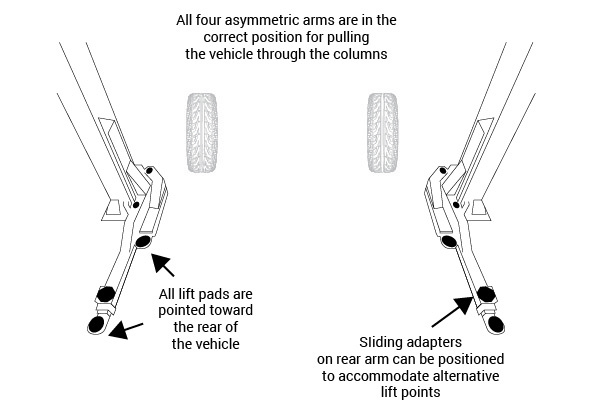 By making shorter arms for the front and longer arms for the back (asymmetric arm configuration), this allows a vehicle to be positioned between the columns with approximately one third of the car in front of the column and two thirds behind the column. To properly load any vehicle onto an asymmetric hoist, all the arms with lift pads need to be pointing toward the rear of the vehicle. The shorter arms would then be pulled forward and the lift pads positioned on the appropriate forward lifting points. Similar with the rear arms positioned at the lifting points near the rear of the vehicle. This configuration would allow the driver’s front door to open wider clearing the columns giving better access to the inside of the vehicle if required. There are two kinds of two-post hoists – 1) with cables and hoses running along the floor with a protective cover or plate, this is known as a base plate model and 2) one with cables and hoses running across the top of the hoist leaving the floor clear for equipment to move unimpeded under the vehicle, known as a clear floor model. The weight of a vehicle must be evenly distributed on each of the four arms of a two-post hoist whether it be a symmetric or asymmetric configuration. 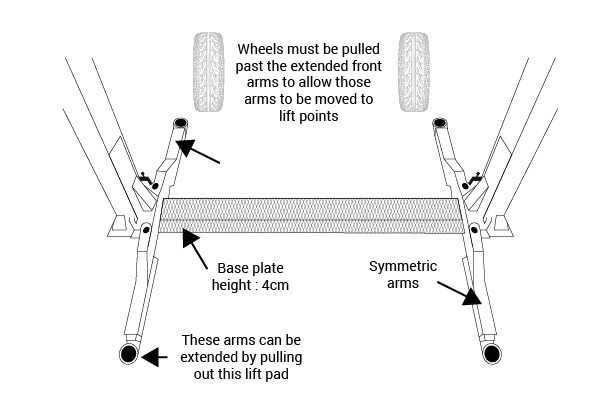 A base plate hoist can have short front arms and long rear arms, but this does not make the base plate lift asymmetric, as the front arm pads could not be moved to face the rear of the vehicle due to a raised metal base plate on the floor between the two columns. This initial positioning of the arms is only possible on an overhead style two-post hoist which is preferred for lifting heavier vehicles. 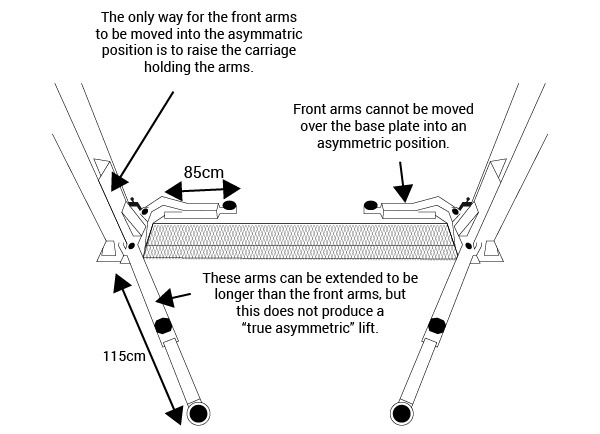 Symmetric arms on a two-post hoist can be extended or retracted so that all four arms are the same length, allowing a vehicle to be raised in the middle of the hoist which is preferred for longer vehicles. Symmetric columns are installed so that the middle of the columns are positioned directly across from each other allowing a wider space to drive through. 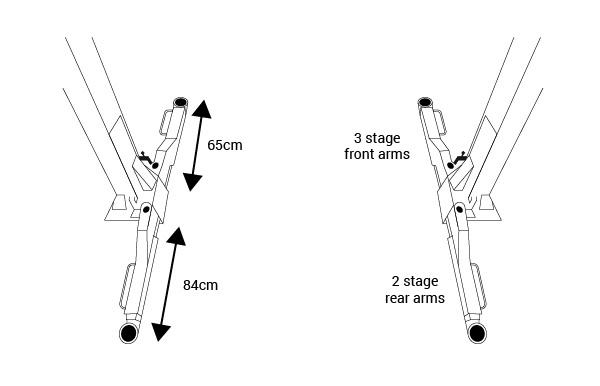 Super symmetric hoists have three stage front and two stage rear arms. The arms can be configured so that they are parallel to each other. 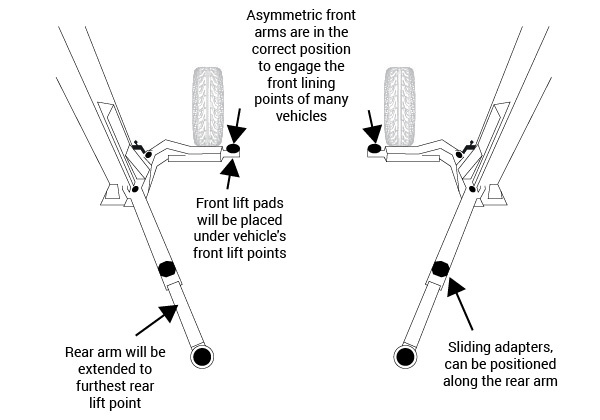 The front arms cannot be turned completely toward the rear of the vehicle like the front asymmetric arms, however, because the three stage front arms can retract to a shorter length than two stage arms, it is easier to position the lift pads on the front arms under the correct lifting points of many short wheel base vehicles. Please review our complete range of two-post hoists with configurations that include symmetric, asymmetric, or arms that offer a combination of both (asymmetric/symmetric) or super symmetric.